Greece is a country with a very long spiritual and religious history that has produced many great, world-renowned philosophers, including Plato, Socrates, Aristotle, and many others. Athens, the capital city, has a population of over 4.5 million, and each year many thousands of tourists go there who are keen to learn more about Greece's unique culture and to visit the many truly monumental historical sites that the country is proud of, such as the Acropolis. 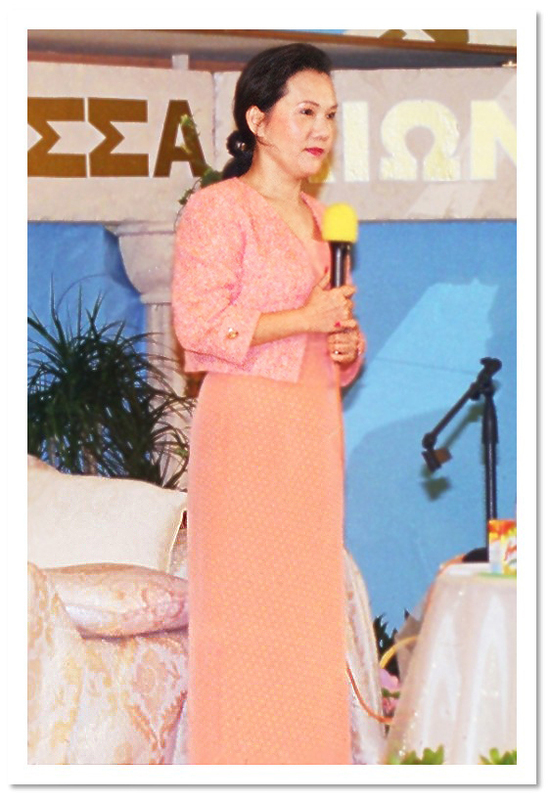 On the evening of May 20th, the fortunate people of Greece packed into a centrally located venue, the Park Hotel, eagerly waiting to be graced by the presence of the Supreme Master Ching Hai. Elegantly attired in an orange dress, Master received a very warm welcome as She stepped onto the stage. Master began Her talk by reminding the people that Greece is a great country full of mythology regarding gods and goddesses. Master further explained clearly: "Knowing God is the only virtue that we must acquire. Ignorance is the only sin we must avoid. Ignorance makes us kill each other, hate each other, damage each other, and compete with each other." "Ignorance means we don't know that we all are God. Because all the scriptures say that God lives within this temple, so all we see here and everywhere else are God's manifestation in the physical realm. Because of this ignorance, we make war with each other and we acquire greed of every kind because we are not satisfied with the world. Because we came from the Kingdom of God, where we never lacked anything. When we are here we miss that kind of absolute comfort." "The only thing to stop this is enlightenment, is knowing our true self, which means we visit the Kingdom of God, we visit our true home whenever we want every day in order to know that we have something better and everything here is just temporal and we lose interest in these fake things because we know the true glory. Master said further: "Seeing God is like this, [Master snapped Her fingers], easier than getting a taxi in central Athens." "Enlightenment must be transmitted, a living force from being to being, from soul to soul, directly inside." On the completion of Master's lecture, the crowd had the opportunity to ask for further information about specific topics. Many questions came flooding in and Master patiently spent time answering and clarifying further to the sincere seekers of Truth. Master stood up throughout the entire lecture and question and answer period, because many people would have been unable to see Her if She had been seated. Fatiguing as that must have been, once again we were reminded of Master's unconditional sacrifice for other people and that She always considers them first and Herself last. On completion of the lecture, many people rushed to the front of the stage to receive the fruit, candy and flowers that Master kindly distributed. Some people, realizing how rare and precious this occasion was, handed Master their sample booklets or flyers to be signed, at which point She remarked that She was not a movie star. Many people, looking to quench their spiritual thirst, requested initiation into the Quan Yin Method of meditation.